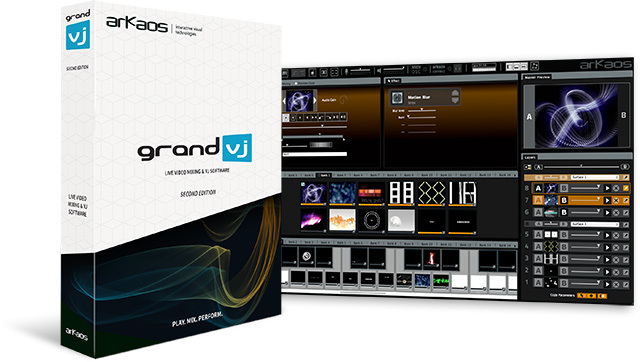 Get your GrandVJ 2 license now! 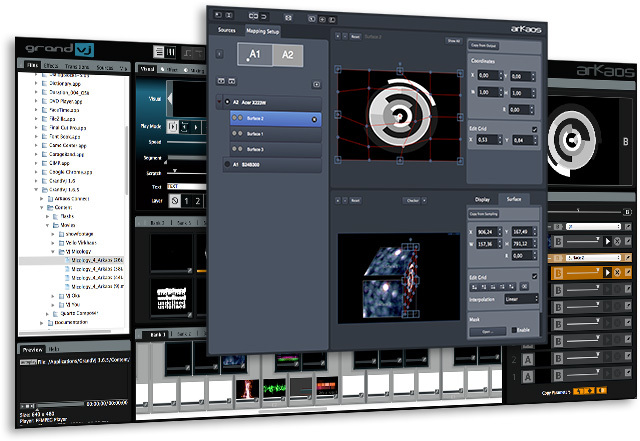 You can already get your GrandVJ 2 license now and start working with the Beta version, or choose the GrandVJ XT license and get access to the new Video Mapper extension! We’ve added cool new effects such as « Edge Glow », « Video Signal Distortion » or a very useful « Color Correction » effect that can help you quickly fix Hue, Saturation or Lightness on a video in a live environment. The video processing engine has been updated, bringing support for the latest codecs and improving performance with older ones thanks to a better use of multithreading. 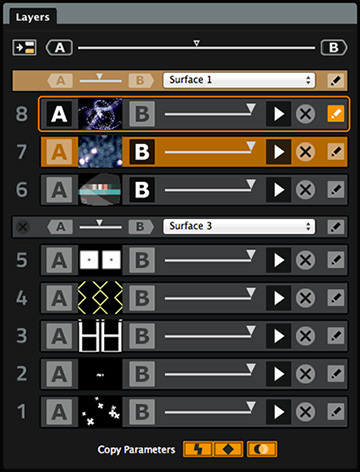 GrandVJ XT can send layer or cells output to virtual “surfaces” that can be scaled, deformed, and assigned to any physical output. One output can display a full screen visual or a composition of several mapped visuals, so you can easily create complex visual compostions on a set of LED screens – even with different resolutions – or just output to a video projector and deform the surfaces to flow them across any physical volume (like objects, or buildings..). You can upgrade from any version of GrandVJ to GrandVJ XT from your customer account, now or later. For our GrandVJ 1 users that are eager to use the Video Mapper, there’s a one step upgrade from GrandVJ 1 to GrandVJ XT with a -10% loyalty discount during one month. We have completely reworked the software activation system to make it much more straightforward, flexible and user friendly (no more lengthy codes to copy/paste). You can now activate and use GrandVJ 2 on up to two computers at the same time with one license (i.e. main computer and backup) – instead of one with the GrandVJ 1 license agreement. You can also deactivate GrandVJ 2 on a computer before activating it on antoher, which allows temporary use of the software on any computer. The activation/deactivation process requires that you connect your computer to the Internet. GrandVJ 2 / GrandVJ XT are currently available as Beta software and as such, is not recommended for professional use or use in situations where performance and stability are required. The term VJ has grown to cover a wide variety of artistic and technological styles. The VJ is constantly pushing the boundaries and redefining what a VJ is and what a VJ does by utilizing practices that often seem so far stretched between them that it is increasingly harder to pin down what a VJ is all about. To demonstrate the evolving nature of the VJ term, one only has to notice the overlooked change in the meaning of the term itself: From VJ – Video Jockey to VJ – Visual Jockey, and to realize that VJing incorporates many more practices than just video mixing. The term VJ was first used in the late 70s in New York Club Peppermint Lounge and gained fame on MTV in 1981 when the presenters were described as VJs. In 1990 UK’s channel 4 artist show « Addictive TV » ran an article on the VJ culture on national television for the first time. However, the VJs historical roots can be traced to earlier periods than the term itself. In this essay I have decided to emphasize on two artistic approaches that, in my opinion, have had strong influences on the VJ culture and have determined the paths that VJ artists have taken. The first is the underground club culture and the second is the Avant-Garde art movements. These have had major influences on the way VJing is perceived today and on the way VJs describe themselves. DJ by helping to bring it to the public’s awareness and was intended to glorify the VJ culture and the VJ artist to a similar status of a DJ. However, to the VJ this has proven to be both a blessing and a curse. Club cultures are identified by the different styles of music that they play to different music cultures. DJs that come from those individual cultures are best suited to represent the type of sound for that crowd and more importantly, people who go to clubs want to dance. « Amongst youthful crowds, DJs were […] leaders and local celebrities. » (Thornton, 1996, p. 62). To club owners and the music industry « DJs have become a commodity, a name on a flyer, an investment. » (Haslem D. in Redhead, 1998, p. 161) To club owners the role of the VJ in the club is seen to be closer to that of a sound man or a lighting professional. The DJ has the status and the VJ will always be playing second fiddle in the clubbing scene, an aesthetic role, one which can be rendered to visual wallpaper. The development of graphics and video synthesizers by DIY electronic enthusiasts in the early 60s and 70s has given the ability for individuals to experiment with video graphics for the first time and another Fluxus member, Nam June Paik invented the PaikAbe video synthesizer. « As collage technique replaced oil paint, so the cathode-ray will replace the canvas. » (Dempsey, 2002, p. 257) In the 80s, technology allowed the development of video effects hardware that was purchased and spread to the clubbing scene. By the early 90s computers allowed the use of digital visual processing and the Amiga Video Toaster was one of the first desktop publishing systems. 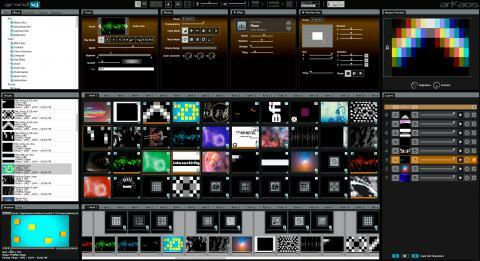 The first VJ aimed software was the Vujak which was written by Brian Kane and was then followed by fully functional commercial VJ applications such as MotionDive and VJamm. The VJ has evolved out of the club scene and into other artistic disciplines like video art, performance art and interactive displays. The VJ term now incorporates video clip makers, video editors, animators, software designers, interactive and stage and light designers. VJs pride themselves on developing their own kits and installations in a DIY fashion. 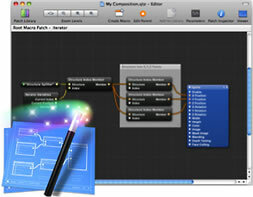 VJs have converged into every visual art form where technology is involved. But as things came naturally to the VJ, the correct definition of the term VJ has never been successfully established. VJs did not stop to think about their cultural role and their message, and so « VJ » became an empty term without a correct definition of its culture and values. « The definition of VJ has not been pinned down as it is still in its infancy. » (Walter, S. in D-Fuse, 2006, p. 46). In the VJ community there seems to be a division between those who describe themselves as VJs, and occasionally use the VJ as a prefix to their name to describe who they are and what they do, and those who consider themselves media artists but still use the name VJ to categorize themselves. The first type of VJ is usually associated with underground cultures and I will describe it as the « Club VJ ». Here the focus is on club and stage performances expressing one&s self more on the visual side of the art work. For here the image itself is the most important part of the show, the esthetics of the visuals, the quality of the rendered video and projected images. The sequence and the order of the videos and the layout of the visuals are what build the show. Club VJs are usually individuals who work on their own and try to make a name for themselves in the industry. To these artists the term VJ is important and an integral part of how they are perceived by the community. These artists may collaborate on other artistic projects and team up with other creative artists, usually on one-off events or projects, but seldom on an on going basis. « VJ Anyone » is a good example of this type of VJ. VJ Anyone gained his reputation in the club scene and on the stage doing gigs: « I spend a lot of time storyboarding my sets – good visuals work best in sequence, in context. Images can spoil each other if shown in the wrong order, in combination with conflicting subjects, colours and layouts. » (D- Fuse, 2006, p. 84) Artists like these will normally demonstrate their video clips on their website as promotion material of what they do and who they are. The second type of VJ I am referring to is the « Artistic VJ ». Those will seldom define themselves as VJs and prefer to use terms such as media artists, visual artists, interactive artists or a variety of other bombastic definitions. When confronted with the question « Are you a VJ? » the response tends to be « I may do some VJ work occasionally » suggesting that the work of a VJ is confined to clubs and the dance scene and therefore does not represent the line of work they would like to be associated with. These types of artists normally work within a group or a company. Their title name will (probably) never have the term VJ in it. Even when asked directly about their VJ work, they seem to avoid using the term VJ to describe their work and instead will give examples that are related to other disciplines or change the subject altogether. As an example of this theory I will use Chris Allen of « The Light Surgeons », an internationally famous UK based group that has gained their reputation as experimental visual artists: « Our work is many things: filmmaking, installation and performance, as well as print and photography. It spills into many different disciplines and blurs the boundaries between art and design, film and theatre. It’s not about VJing – that is a term that I have never really felt described our work. It’s taking a more musical and expressionistic approach to filmmaking and design. » (D-Fuse, 2006, p. 87) According to this notion, the VJ artist seems to have lost his title (VJ). When a VJ works in a gallery space he will describe himself as a visual artist. When a VJ is involved with interaction he becomes as interactive artist, when a VJ takes to exploring musical content he becomes a musician. Where he creates his own filmed material he is a filmmaker, and when he combines them all he becomes a multidisciplinary artist or an artist – engineer Constructivist. 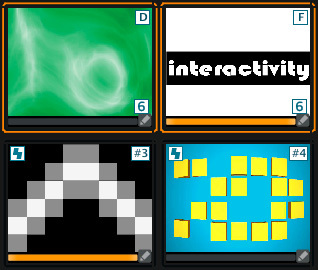 As technology has evolved, so has the VJ artist with his love and enthusiasm for the latest technological inventions. VJs have embraced technology and used it to infiltrate into new practices. « It is fraudulent treating these diverse art forms as one. Other disciplines have had a bearing on A/V and VJ culture, as well as vice versa. 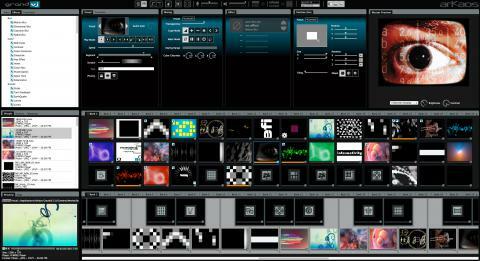 » (Doyle, A. of OneDotZero in D-Fuse, 2006, p. 46) Technology has become the main driver behind the VJ into exploring new methods of visual creativity. The VJ expanded into other artistic disciplines and converged with other cultures. The development of technology itself has had a big influence on the work VJs were producing. Following every new technological improvement, the VJ was keen to be the first to ‘wow’ the crowds with new technology based visuals and interactive displays that have not been seen by the public. Building new installations for events and developing new ways to produce graphics have become an art form itself. The machines generated the visuals with less and less direct control from the visual operator and the visual content that is displayed on the screen is not as important as the process of creating it. This creative approach obviously speaks to the art community that is interested in the process and have the tools to understand and evaluate the work based on the methods of creation. The types of visuals are generated from machines will often have a technological « feel » to them and are influencing the link between visuals and technology. Clubs today have become a major entertainment factor for young people. In the clubs, VJs have been able to reach to the « real » people, the ones you would not expect to find in an art gallery or a museum. Clubs and raves became the natural space for a VJ to show his work. The visuals work well with the clubbing scene. The VJ has become a live performer who works side by side with the DJ mixing visuals to the music rhythm. The club became the perfect place for a beginner VJ with a limited budget and limited access to technology to show his work to the public, and since most clubs don’t have house VJs and visual equipment, getting work as a VJ or a « House VJ » is relatively easy. All that is needed are digital video footage, a computer, software and a projector. While the demand for projected visuals in clubs has grown, talent and creativity was not as important to the club owners as they saw the VJ as a visual technician more than an artist who is cheap to deploy and good enough to satisfy the crowds. In « Where the Stress Falls », Susan Sontag writes that she dreads « the ascendancy of a culture whose most intelligible, persuasive values are drawn from the entertainment industries » and which has spelt the « undermining of standards of seriousness ». Young people today are used to seeing and being surrounded by advertisements and content that influence the way they live and shop. Clubs are a cultural product which is based on trends and fashion, so in that way they are no different than any other space where advertising can be used. « …[A]udio-visual media in our culture are indeed the basic material of communication processes. We live in a media environment, and most of our symbolic stimuli come from the media. » (Castells, 2000, p. 364) Club owners use the screen as a cheap advertising tool by requesting the VJ to project advertisements and rotating logos. On the other hand, when given the chance, most VJs are happy mixing and projecting anything they can get their hand on. It is therefore common to see a VJ project a logo or a promotion for a product that was not discussed before entering into a financial agreement with the club. The VJs are giving this free advertising without judgment and are being exploited. When left to their own devices VJs tend to use video loops of a psychedelic nature. Those visuals follow the same design that is used to promote the events on club flyers that are often designed by the VJs themselves. « After using 3D Studio for several months we developed our own and we still believe unique attitude towards mixing visuals for clubs. Everything is live and original. From me, Fraser, mixing industrial or psychedelic computer graphics overlaid over more computer graphics, to Dan mixing computer graphics with pre-recorded video sequences from various sources. » Due to the lack of creative criticism from club owners and clubgoers and the fact that VJs were finding it easy to get their « foot in the door », clubs became the place for experimentation and has often resulted in projected material of bad standards and lack of understanding of the media by the VJs themselves. This did not matter to the people who come to the clubs as they were not paying much attention to the projections anyway as they were there to dance. McLuhan describing the television as a cool medium in that the viewer’s experience in front of the screen is passive: « …the viewer is the screen. He is bombarded with light impulses ». (McLuhan, 1964, p. 341) The club « viewer » was not there to watch the visuals but to dance. For the inexperienced VJ this was not an accepted reality. « In their quest to get their work (as well as this of their peers from the VJ fraternity in most cases) appreciated as it should, they often aim to compete for the top spot usually reserved for the DJ or main music act. Unfortunately, this can often translate as a race to capture the audience’s undivided visual attention with the screen(s) becoming the dominating focus of the space rather than a complement to the other visual stimuli such as lighting, decor as well as the stage performers and the audience themselves. Content becomes everything and having a cinema-style environment to the club where the whole audience is glued zombie-like to the screen(s) is seen as a satisfactory outcome. » (Bernard, D. « Visual Wall Paper », in www.vjtheory.net, October 2006). However you look at it, VJs have overcome the hurdles of having to please an art critic or gallery curator to get their work displayed. VJs’ invented art space was the club instead of a gallery. They were showing their work to the masses with little or no artistic criticism and by doing this they have managed to naturally develop as a subculture. Not out of rebellious awareness, but out of naiveness and necessity. According to Sarah Thornton, « the word ‘subcultural’ [is] a synonym for those practices that clubbers call ‘underground’.’ (Thornton, 1995, p. 8) « Subcultures are best defined as social groups that have been labelled as such […] Communications media create subcultures in the purpose of naming them and draw boundaries around them in the act of describing them. » (Thornton, 1995, p. 162) Hebdige defines the meaning of a subculture by stating that a subculture needs to be identified by its own style. According to this notion, the style of the VJ is the technology. If we are to accept Hebdige’s claim that style is what defines a subculture then by using technology as a style, the VJ is claiming its uniqueness as a subculture. the digital culture. A key to forward movement is expanding notions of what is possible and offering tool to inspire and create. » (D-Fuse, 2006, p. 46) McLuhan takes this notion even further by describing technology as a religion: « By continuously embracing technologies, we relate ourselves to them as servomechanisms. That is why we must, to use them at all, serve these objects, these extensions of ourselves, as gods or minor religions. An Indian is the servo- mechanism of his canoe, as the cowboy of his horse or the executive of his clock. » (McLuhan, 1964, p. 51) Shane Walter of OneDotZero described the importance of technology to a VJ: « I see technology becoming more and more transparent ». (D-Fuse, 2006, p. 46) « In the electric age we wear all mankind as our skin. » (McLuhan, 1964, p. 52) So according to McLuhan, technology is something we wear. In the same way we buy our clothes according to a style, the VJ has to keep up with the latest technology according to the style. The « VJ » label has had a massive impact on the way it has been perceived by those who wish to be included within it or decided to ignore it. To some it helps define what they do and how to present themselves. To others it has become a restrictive term that confines their artist interests and capabilities. To all that are involved with the term VJ there is still a perception that they are number two and can never be as famous as the (superstar) DJ. After all, the term VJ has been closely associated with the term DJ from its very beginning. It may not be a far-fetched assumption that at some point VJs will start labeling themselves as DJs – for Digital Jockeys! Castells, M. (1996) The Rise of the Network Society. Malden, MA: Blackwell Publishers. D-Fuse (2006) VJ Audio-Visual Art + VJ Culture: Laurence King Publishing Ltd.
Dempsey, A (2002) Art in the Modern Era: A Guide to Styles, Schools & Movements. NY: Harry N. Abrams Inc., Pub. Redhead S. (1998) The Subcultures Reader: Blackwell Publishers Ltd.
Sefton-Green, J (1998) Digital Diversions. Youth Culture in the Age of Multimedia: UCL Press. McLuhan, M. (1964) Understanding Media: Rouledge and Kegan Paul Publishing Van Dijk, J. (2006) The Network Society. Sage Publications Ltd.
Anomes annonce la sortie de Millumin le 4 octobre 2012, une soirée de présentation du logiciel de création vidéo et multimédia aura lieu à La Cantine de la Silicon Sentier sur Paris à 19h30, suivit à 20h30 d’un buffet autour d’installation audiovisuelles.